The State of North Carolina is not doing enough to promote the health of its people. In 2010, the State of North Carolina identified 13 major health focus areas and established 41 decennial health objectives and targets to meet by the year 2020, with the goal of making North Carolina a healthier state. Unfortunately, our state is nowhere close to reaching this goal anytime soon. With eighteen months to go until 2020, analysis of new state data shows that not only will our state not come close to achieving these health objectives but also that our state is worse off today in 17 key health objectives compared to nine years ago. In other words, instead of making progress towards becoming “one of the healthiest states in the nation,” various health conditions in North Carolina have gotten worse. Moreover, North Carolina has consistently trailed other states in overall health rankings for almost two decades, and currently ranks 33rd in the country. 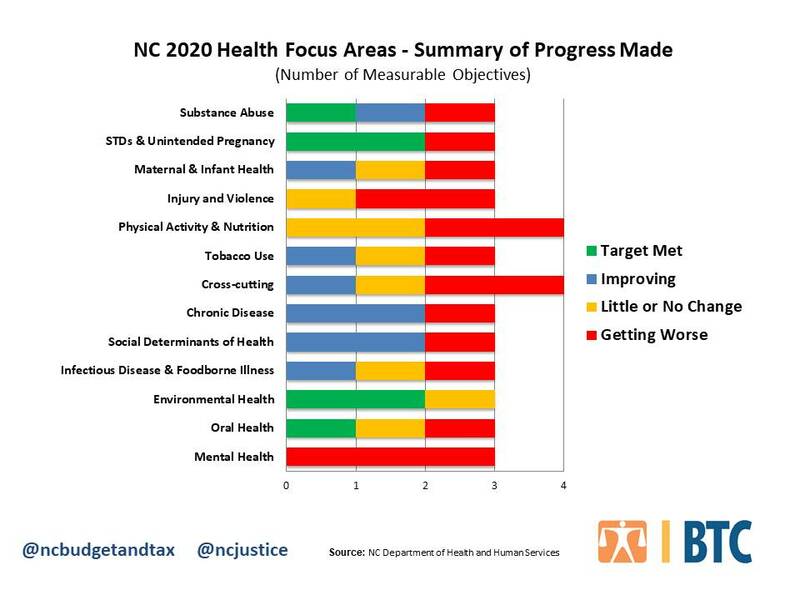 Based on the evidence it is clear that in order to improve our state of health and make progress on our 2020 goals a real concerted effort is needed from health professionals, insurers, business and community leaders, advocacy organizations, consumer groups, the faith community and North Carolina’s residents. Over the summer I will be releasing a series of posts covering more in-depth some of the state’s ‘Healthy NC 2020’ focus areas, the goal of which will be to lift up where we are falling short and how we can make progress for the state and for each North Carolinian whose health and well-being depends on the policies and systems that support them.